Go into your garden or local vegetable market and this dish is like summer in a bowl. I was inspired to make this dish after getting some fresh oregano from the garden. It will definitely be my new summer favourite. In a sieve, rinse quinoa under cold water. Add quinoa and 2 cups of water to a medium pot. Bring to a boil on high heat. Once it boils, reduce heat to low, cover and cook for 7-10 minutes. Don’t lift the lid to stir. Turn off the heat and let sit on the stove until all the water has evaporated. Set aside and let cool. Start with making the dressing. In a large bowl, whisk together the olive oil, apple cider vinegar, lemon zest, lemon juice, and garlic. For added flavour, marinate the red onion in apple cider vinegar for 30 minutes while you prepare the other ingredients. It isn’t necessary, but it adds an amazing flavour. I highly recommend this step. Put the sliced onion in a bowl, cover with apple cider vinegar and let sit. Add all the remaining ingredients, except for the quinoa and balsamic vinegar, into the bowl and gently toss to coat with dressing. 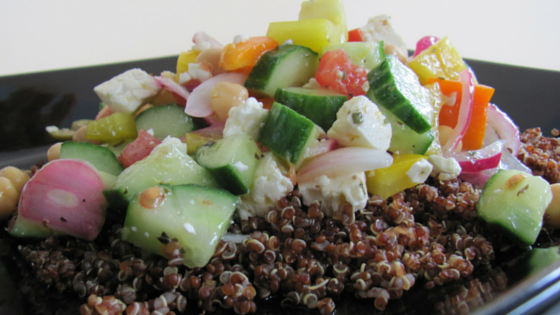 Add a scoop of quinoa to each plate, drizzle each with balsamic vinegar and top with salad. Optional: Add a bed of arugula or spinach for some tasty greens. ← You Relocated, Now What?